We are preparing to gear up our national effort to remove Kevin Jennings from his position as national "Safe Schools Czar." So we need your financial support more than ever. In return, we have a special gift for you: You can see where it all started! 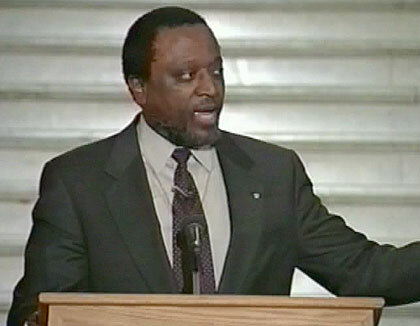 Dr. Alan Keyes gave an incredible speech that day -- that shook the Mass. State House. Here's our offer in exchange for your gift: An incredible documentary that will open your eyes in a big way to what we're up against and how we need to confront it. (SEE BELOW). 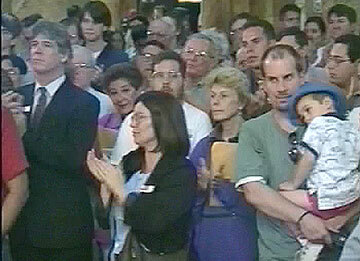 Ten years ago the pro-family movement was re-defined by a single speech before hundreds of people at a rally inside the Massachusetts State House -- the epicenter of funding for homosexual activism in the schools -- and which became a model for their activists nationally. Now you can see the documentary of the blockbuster speech and first mass protest against Kevin Jennings' homosexual agenda in the public schools -- where (unfortunately) it all began, in the Massachusetts State House -- by the most powerful pro-family speaker of our time, Dr. Alan Keyes. Also speaking were the Republican minority leader and others! As MassResistance prepares to rejuvenate the grass-roots counter-revolution against the homosexual and transgender assault on schoolchildren and society, we are re-releasing the documentary of this epic speech and the events surrounding it. 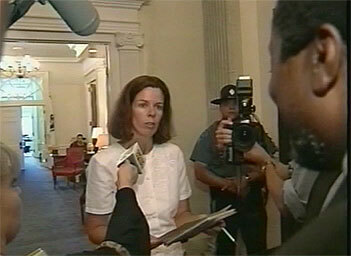 In March 2000 the horrific Fistgate conference run by Kevin Jennings (now Obama's "Safe Schools" Czar) took place at Tufts University in a Boston suburb. At that conference kids as young as 12 were instructed by public employees how to engage in disgusting and dangerous homosexual sexual acts. Two of those workshops were audio-taped by Scott Whiteman, then Executive Director of Parents' Rights Coalition (now MassResistance) and were released to the press. But despite parents' outrage and widespread publicity, public officials including the Middlesex County District Attorney (then Martha Coakley), the State Board of Education, the Commissioner of the Dept. of Education, and others refused to take it seriously. 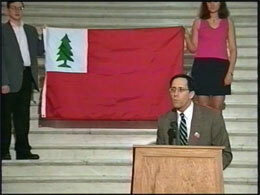 To add further insult, in June 2000 the Legislature and RINO Gov. Paul Cellucci budgeted $1.5 million of state money for more homosexual programs in the schools -- much of it going to Kevin Jennings' group GLSEN, the same group that put on the Fistgate conference! The pro-family community in Massachusetts was outraged like never before. Thus, on July 25, 2000, former US Ambassador and nationally renowned orator Dr. Alan Keyes came to Boston at the invitation of Brian Camenker, the Parents' Rights Coalition, and Massachusetts News to send a booming message to an oppressive government -- and he delivered! The front part of the crowd, which stretched around and back. At the State House rally Keyes gave arguably the most powerful pro-family speech ever given in a state capitol. Also speaking that day were Brian Camenker, Republican Minority Leader Fran Marini, Attorney Chester Darling, talk-show host Jeanine Graf, and others. * The distortion of "tolerance"
Listening to Alan Keyes at the State House. This is a speech worth listening to over and over. There were other key speakers supporting the movement . . .
Brian Camenker, President of Parents' Rights Coalition (now MassResistance). Jeanine Graf, WTKK 96.9 FM Radio Talk Show Host. One of the most fearless radio personalities ever in Boston. Have you ever wondered why so few "conservative" talk show hosts ever take on the homosexual agenda? 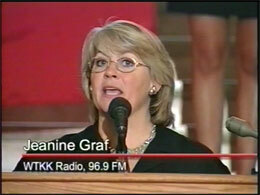 Back in 2000 Jeanine Graf had the then-popular 7pm-10pm evening weekday time slot at WTKK-FM. When "Fistgate" happened she was the first one to play the tapes on the air and continued to cover it, keeping people informed and interviewing people from Prof. Alan Dershowitz to Peter LaBarbera (Americans for Truth about Homosexuality). Within a month of this speech, she was suddenly let go by the station. A homosexual executive at the station made it happen, according to reliable sources. Since then the message has gone out loud and clear in Boston radio: Stay away from the homosexual issue. 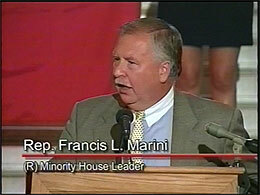 Rep. Fran Marini - the Republican Minority Leader of the Massachusetts House of Representatives strongly supported us in this fight, and personally spoke at this event! Compare it to today, when Republican politicians everywhere run away from this issue like frightened mice. 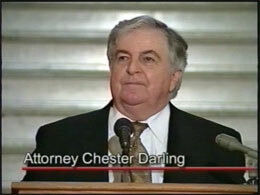 Attorney Chester Darling, the legendary Massachusetts pro-family lawyer who took the famous South Boston St. Patrick's Day Parade case all the way to the US Supreme Court and won 7-0 after losing over and over in the state courts. Darling was also representing Scott Whiteman of Parents' Rights Coalition in the Fistgate lawsuit filed against him by homosexual activists. 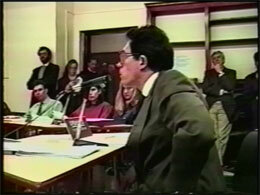 January 1993: Brian Camenker confronting the Newton School Committee on homosexuality in the 6th-grade curriculum -- and getting shouted down by Committee Chairman. This was Camenker's first public activism ever on pro-family issues, and led the way to the formation of Parents' Rights Coalition and eventually MassResistance. 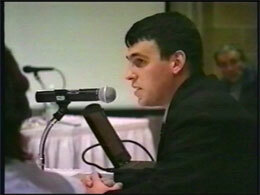 April 2000: Scott Whiteman giving graphic testimony about before the Massachusetts State Board of Education about the horrific Fistgate incident which had happened just weeks before. Despite the shocking descriptions of what the Dept. of Education had done to children, the Board barely acknowledged Whiteman and declined to take any action. 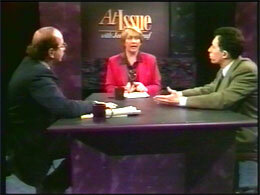 May 2000: Brian Camenker debating homosexual activist David LaFontaine, chairman of the Governor's Commission for Gay and Lesbian Youth, on "At Issue" television show. It was LaFontaine who invited Kevin Jennings to head the Governor's Commission Education Committee, for which he wrote the template for "Safe Schools" programs now used across the nation! Read more about LaFontaine on the MassResistance blog. Dr. Keyes (leading crowd) in front of Governor's office as staffer tells him that Governor is "unavailable" and state trooper guards entrance. This 75-minute documentary, produced for Parents' Rights Coalition by Massachusetts News and the late Edward Pawlick, was originally released in 2003 as a VHS tape. We've kept the format intact with a few minor updates for the 2010 audience. This MUST-SEE video will change your outlook on the "culture war." Special offer - Get educated & fight back! by December 31 will receive a free copy of this DVD. Please support MassResistance, the most effective counter-revolutionary pro-family group in America. Be part of the solution! Help MassResistance stop "safe schools czar" Kevin Jennings from pushing homosexuality on our nation's schoolchildren. ALL donations are confidential. We do not sell or lend any of our lists. Donations to MassResistance are not tax-deductible. To make a tax-deductible donation make check out to "Parents' Education Foundation."